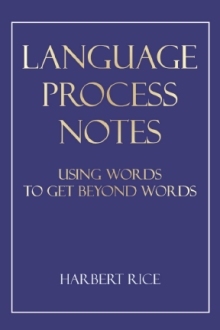 Language Process Notes is a book of experiential philosophy. It draws upon the philosophy of Eugene Gendlin's "Process Model" to explore how three practices, Quaker Meditation, Focusing, and Nonviolent Communication (NVC), lead to personal change and transformation. Language Process refers to an understanding of language in relation to felt experiencing, which lets us see these three practices as using words in order to get beyond words” to change and transform our lives, and to speak (use) words in a new way. Language Process Notes describes experientially "crossing"� each practice, and provides a further understanding of how experiencing and knowledge of one practice may enhance another. Notes, for example, shows how non-violence arises from felt experiencing to change and transform conflict situations. Harbert Rice is a Quaker, a member of the Reno Friends Meeting (Reno, NV). He has been Clerk of the Meeting, Clerk of Ministry, and Recording Clerk. He also has taught and led Quaker Meditations, called Light Meditations, in the Reno Meeting. For the last ten years he has done volunteer service. First, he served as a hospice volunteer. And, for the last five years he has facilitated Alternatives to Violence Project (AVP) workshops in the Nevada prison system.